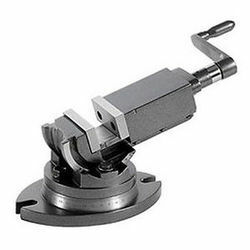 Product Description:We hold expertise in manufacturing and supplying of a wide range of 2 Way Precision Tilt & Swivel Angle Vice. Fabricated with high tensile closed grain cast iron, the vice body is hard in construction. Further, these vice divisions consist of steel jaw plates which are grounded and hardened to 50-58 HRC. - Jaw Plates are ground and Hardened to 50-60 HRC. - Swivel Range 360° around Base. - Low base design for use on drilling, milling and shaping machine. Body made from graded cast iron, jaws hardened & ground suitable to hold angles jobs. Fine acme thread screw made out of special steel. Quick alignment to machine tables using a longitudinal slot. • High quality ACME steel screw. 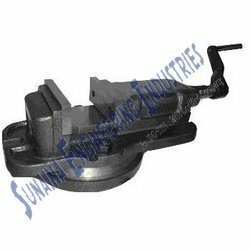 To furnish the diverse requirements of our clients in best possible manner we are engaged in offering an extensive range of Tilting & Swivel Vice. These are fabricated using quality assured raw materials and advanced technology that ensures their high durability. - The enclosed lead screw and sliding surface are harden and grounded Highest clamping power. It's very accurate and durable. We have carved a niche amongst the most trusted names in this business, engaged in offering a comprehensive range of Swivel Milling Machine Vice. - Available in 4" & 6"
Sturdly & accurately made machine vices from grain casting. Fine acme thread screw. Jawa are made of special steel properly hardened, fixed jaw is provided with is provided with vertical & horizontal ‘V’ groove to hold the job family.